FC Barcelona and a trio of prestigious institutions in the city of Barcelona have joined forces to foment education and research in the fields of medicine, exercise, and sports, the Club announced on Tuesday. 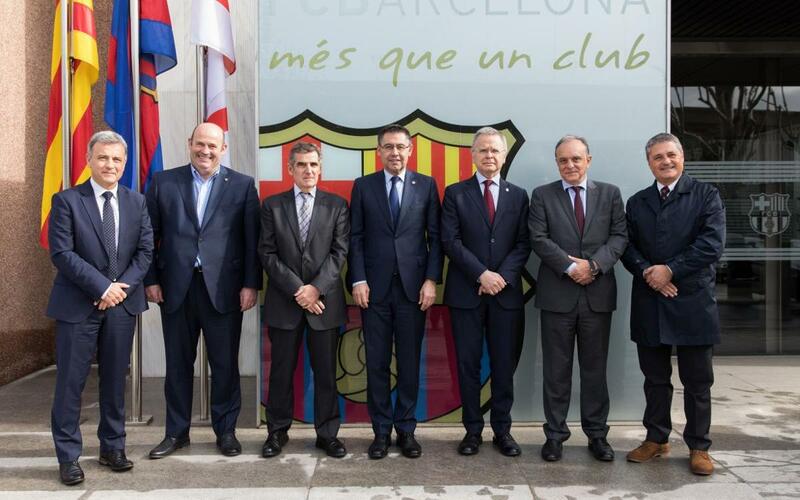 Barça, thus, will be working along with the Hospital Clínic of Barcelona, the Hospital Sant Joan de Déu, and the Universitat de Barcelona, to promote initiatives relating to education, training, and research in those fields. The deal was formalized in a ceremony held in the office of FC Barcelona President, Josep Maria Bartomeu and was attended by a panoply of directors and executives from all organizations involved, including Club CEO, ÓscarGrau; the Hospital Clínic CEO, Josep Maria Campistol; the Sant Joan de Déu CEO, Manel del Castillo; and the Dean of the Universitat de Barcelona, Joan Elías. The agreement will allow medical Residents at the two hospitals to receive specialized training in Sports Medicine — which has long been a pillar of medical education in Catalonia — and will create undergraduate and postgraduate courses there through the Universitat de Barcelona. FC Barcelona’s involvement in the project comes through the Barça Innovation Hub, the Club’s area dedicated to promoting the sharing of knowledge, education, research, and innovation the Club generates.